Hello Ladies! It's been raining glosses for me and it is Diva Likes which is making it happen. 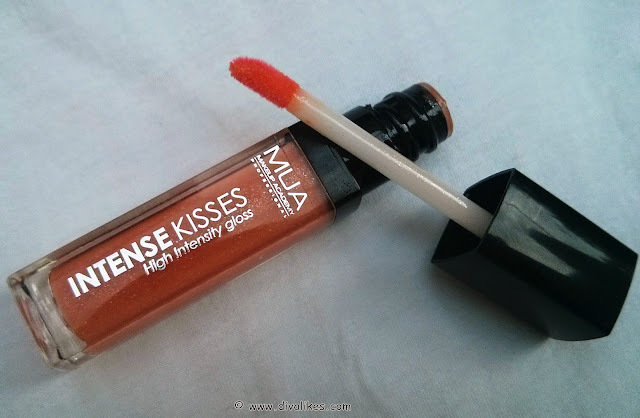 The product I'm going to review today is the third consecutive gloss product I have been reviewing. I love all the gloss attention! MUA lip products have impressed me a lot off late. Not Just the ones I have tried, but also the ones I have read about on Diva Likes. 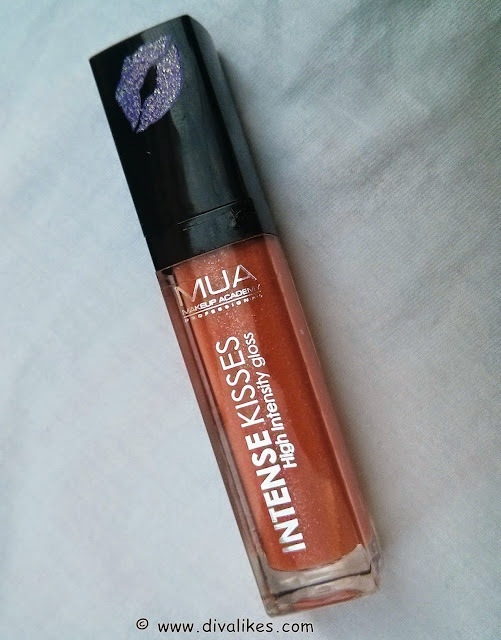 When I got hold of MUA Intense Kisses High Intensity Gloss Smooch, it looked very exciting & I couldn't wait to give it a try. Once I did, I couldn't wait to review it for all of you. So here it goes! It comes in a rectangular see through tube, with an opaque screw type cap. The applicator is sponge type, which is attached to the black colored cap. It is very convenient for a smooth and easy application. 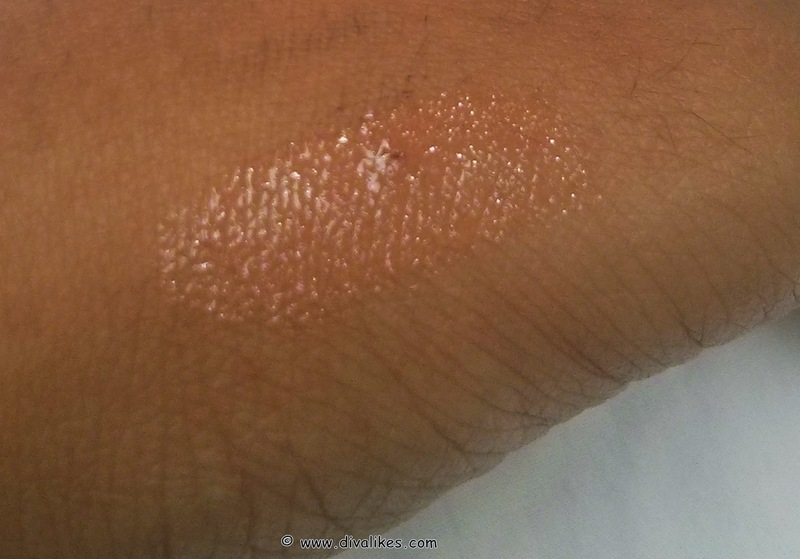 The product is a mild tinted orange liquid with millions of glitter particles floating in it. It is an almost transparent gel which gives you a glittery & glossy coat over your lips when applied once. It looks like a transparent gloss with glitter in it. When the second coat has been applied the tint just gets a little dark but still does not give you an opaque look. 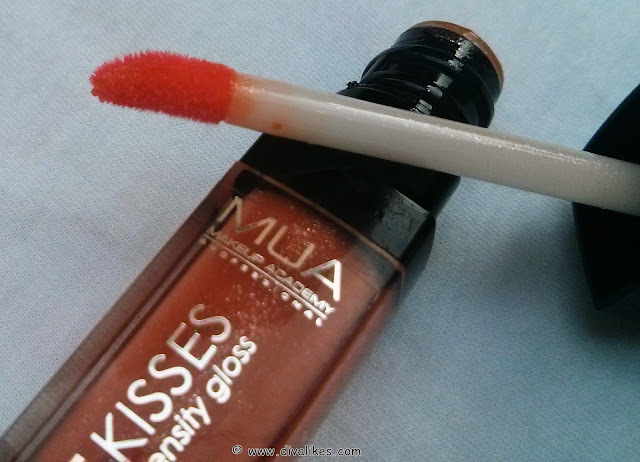 The gloss itself is made such that it will never give you the full dark shaded look. It is always sheer but always glossy & glittery. The consistency of the product is like toothpaste. I know it's an unusual comparison but it does feel like toothpaste. The gloss stays on for over 2 hours after which the glossiness slowly starts disappearing leaving behind the glitter particles. What I hate about this product is the fact that the glitter particles spreads all over the face making you look like a disco ball. I was disappointed with the glitter spread and there is nothing which makes me like this product. The consistency of the product is good. Not worth the price even a bit. Glitter particles spread all over the face. It is nothing more than a tint. I see no reason to buy this product. But I heard reviews of the other shade variants of the same range which are good. So if you think any of those shades impress you, then maybe you should give it a try. 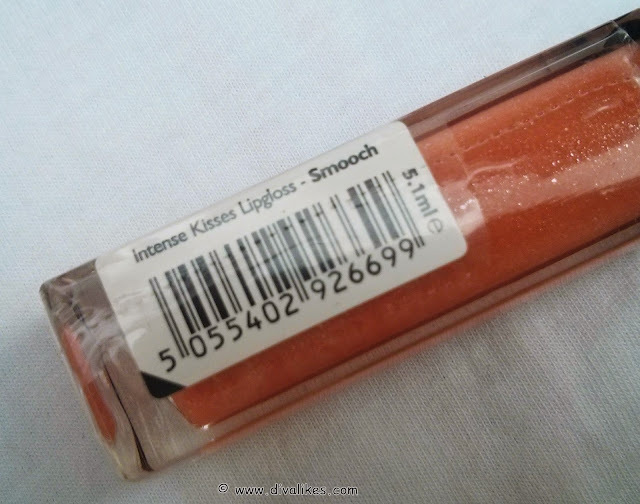 For me, this shade was a total turn off! Oh...didn't expect it to be such a dud! I hate glitter all over face specially when it comes from a gloss. Too shimmery for my liking!